From Nov 1 to 15, all travelers who book an international or regional flights on Hainan Airlines Global Website can instantly save up to 15%! Displayed prices are discounted which include taxes and fees. The international flight class may change in real time due to availability; the specific price is subject to the actual query result, and the query result is the discounted price. 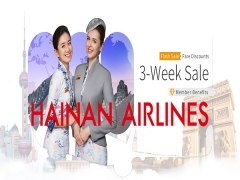 This preferential policy is applicable to Hainan Airlines international and regional routes, excluding charter flights and code-sharing flights. This discount cannot be combined with other offers. Discount will not reduce the taxes or the additional fees which are subject to query results. Refund fees follow the booking class rules for the ticket purchased.